‘The whole company of rangers went out this morning to scour the country towards Bay Verde: they returned in the afternoon, and brought with them a sleigh which our unhappy sufferers had taken out with them, and on it were laid the bodies of four of our men, and one ranger, who were killed and scalped.’ This is from the diary of a Captain John Knox, an Irish born soldier in the British army, who died 230 years ago today. He may have well have been completely forgotten had it not been for the diary he kept (and later self-published) while on service in North America during the so-called Seven Years War. Some 150 years later, the little-known diary had fallen into obscurity, but it was re-published by the recently-formed Champlain Society, and is now considered one of the most important first hand sources for the period. Knox was born in Sligo, though very little is known about his early life - not even the year of his birth. He joined the British army, and served in the War of the Austrian Succession, and distinguished himself at the Battle of Lauffeld in 1747. He was promoted to an ensigncy in the 43rd Regiment of Foot by the Duke of Cumberland. In 1751, he married a relatively well off Irish woman, Jane Carre; and, in 1754, he purchased a lieutenancy in the 43rd. Three years later, he left Ireland with the regiment for Halifax, Nova Scotia. However, the regiment then spent two years stationed at Fort Cumberland, playing no part in either the planned Louisbourg Expedition or Jeffery Amherst’s subsequent and successful siege of Louisberg. 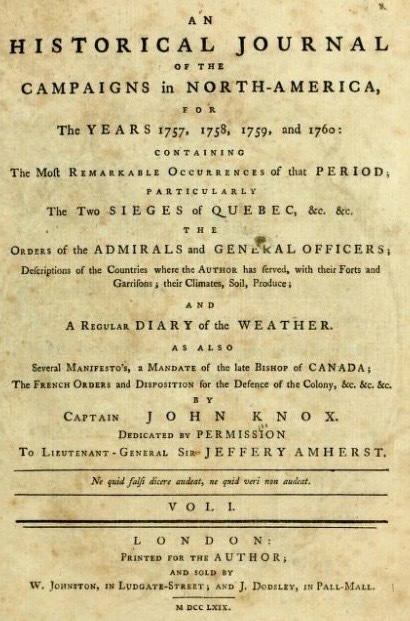 Knox’s regiment did, though, engage in the Battle of Quebec in the winter of 1759-1760 under General James Murray; and it was also with Murray at the fall of Montreal in 1760. By the following winter, Knox is thought to have been back in England. He was appointed captain of a newly formed independent company of soldiers, but this was soon amalgamated into the 99th Foot, which, following the the Treaty of Paris in 1763, was itself disbanded. Knox, by then living in Gloucester, was placed on half pay. His attempts to obtain military preferment came to naught, and he remained on half pay until 1775 when he was appointed to command one of three independent companies of invalids stationed at Berwick-upon-Tweed. He died on 8 February 1778. A little further information can be found at Wikipedia or The Dictionary of Canadian Biography. Knox is remembered today only because he kept a diary during his North American service. On returning to England, he went to the trouble of editing it and having it printed in two volumes: An Historical Journal Of The Campaigns in North-America, For The Years 1757, 1758, 1759 and 1760. The volumes, published in 1769, were sold in two London shops: W. Johnston in Ludgate Street and J. Dodsley in Pall-Mall. They were subtitled, The Most Remarkable Occurrences of that Period particularly The Two Sieges of Quebec etc. etc. Orders of the Admirals and General Officers; Description of the Countries where the Author has served, with their forts and Garrisons their climates, soil, produce; and A Regular Diary of the Weather. Both volumes (one and two) are freely available online at Internet Archive (although the text was printed using the old-fashioned form of s). Nearly 150 years later Knox’s diary was reprinted (1914-1916), in a three volume version, by The Champlain Society (formed a decade earlier to advance knowledge of Canadian history through the publication of scholarly books). The three volumes were edited by Arthur G. Doughty, with the third volume being a series of appendices, i.e. other diaries, letters, historical summaries. Volumes one, two and three are all freely available at Internet Archive. The following extracts are taken from the first of the three volumes. ‘The whole company of rangers went out this morning to scour the country towards Bay Verde: they returned in the afternoon, and brought with them a sleigh which our unhappy sufferers had taken out with them, and on it were laid the bodies of four of our men, and one ranger, who were killed and scalped; the rest are still missing: at the place where these unfortunate people were way-laid, there was a regular ambush, and designed probably against the rangers, who have been out, for some weeks, cutting and cording wood for the garrison, and seldom missed a day, except the weather was uncommonly severe, which was the case yesterday; and their not going was providential, for they are generally too remiss upon service, and so little did they suspect any danger, that the half of them went out without arms, and they who carried any were not loaded. The victims were fired at from the right side of the road, being shot through the right breast; all were wounded in the same place, except one who had not a gun-shot wound about him, but was killed by a hatchet or tomahock a-cross the neck, under the hinder part of his scull; never was greater or more wanton barbarity perpetrated, as appears by these poor creatures, who, it is evident, have been all scalped alive; for their hands, respectively, were clasped together under their polls, and their limbs were horridly distorted, truly expressive of the agonies in which they died: in this manner they froze, not unlike figures, or statues, which are variously displayed on pedestals in the gardens of the curious. The ranger was stripped naked, as he came into the world; the soldiers were not, except two, who had their new cloathing on them; these (that is the coats only) were taken: I am told this is a distinction always made between regulars and others; the head of the man who escaped the fire; was flayed before he received his coup mortel, which is evident from this circumstance, that, after the intire cap was taken off, the hinder part of the scull was wantonly broken into small pieces; the ranger’s body was all marked with a stick, and some blood in hieroglyphic characters, which shewed that great deliberation was used in this barbarous dirty work. The bloodhounds came on snow-shoes, or rackets, the country being now so deep with snow, as to render it impossible to march without them; they returned towards Gaspereau, and we imagine they came from Mirrimichie, there being no settlement of them (as we suppose) nearer to us on that side of the country. ‘Being on a working-party this morning at our batteries, I had a most agreeable prospect of the city of Quebec, for the first time; it is a very fair object for our artillery, particularly the lower town, whose buildings are closer, and more compact than the upper. Some time after we were settled at work, a soldier of the 48th regiment, who had an intention to desert, went to an adjoining wood, where an Officer and a number of men were detached to make fascines; he told the Officer he was sent to desire that he and his party would return to the redoubt where we were employed, and in their absence he took an old canoe that he found on the shore, and crossed the river in our view; a boat put off from the enemy, and took him safe to land. Our batteries are in great forwardness; the two first are to mount six guns and five mortars, and will, in a few days, be in readiness to open. About six o’clock the garrison began to cannonade and bombard us, and continued their fire, almost without intermission, until one o’clock in the afternoon, at which time the working-parties were relieved. Our soldiers told me they numbered one hundred and twenty-two shot and twenty-seven shells, yet we had not a man killed or wounded. Before we reached our camp, we had a violent thunder-storm attended with hail and rain, which laid our incampment under water: the hail-stones were uncommonly large; on this occasion the men were served with rum, pursuant to the General’s regulations.